A wonderful twist on the classic pairing of pork and apples. Using bone-in pork chops will yield not only more flavour but more moisture as well. **Chef Dez note on this recipe** – I have quoted ‘table salt’ for use in the brine – you can use other salts (kosher, sea, etc) as long as they are the same granule size of table salt. A salt with larger granule size actually has less salt per measure because there are more air pockets around the granules. In a large bowl, dissolve the salt in the water by whisking vigorously. Submerse the pork chops in this brine. Cover and refrigerate for 1 hour. While the pork is brining, prepare the slaw by putting the grated apple in a large bowl and tossing with the vinegar to help prevent oxidization (going brown). Add the purple cabbage, green cabbage, carrot, mayonnaise, sour cream, honey, mustard, seasoning salt, and pepper. Toss to mix thoroughly and keep refrigerated. When the pork has finished brining, remove the chops from the brine and pat them dry with paper towel. Preheat your BBQ over high heat until hot. Coat the chops with canola oil and seasoned them lightly with salt and pepper (remember that they will already be seasoned with salt from the brine). When your BBQ is hot, place the chops on the grill and turn the heat down to medium-high. Grill the chops for approximately 5 to 8 minutes per side until just cooked – touching them should feel somewhat firm, but not too firm (overcooked). 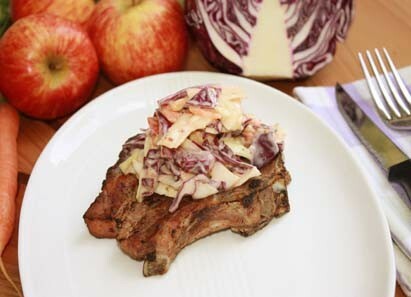 Serve the chops topped with the apple slaw, or on the side, but this recipe shines when both are eaten together in the same bite.